Louisiana’s Cajun Country has a distinct personality, known for food, family, and revelry, and it’s no different when it comes to football. Voted best collegiate team nickname by ESPN, The Louisiana Ragin’ Cajuns embody family fun. If you’re visiting Acadiana during football season, a Ragin’ Cajuns game will score big with the kids, not to mention, go easier on your patience and pocketbook than big SEC games with their notorious traffic snares and inflated ticket prices. Start off your game day at Russo Park (201 Reinhardt Drive), adjacent to Cajun Field. The Kids Zone opens three hours before kick-off with plenty of free activities including inflatable bounce houses, face paint stations, meet-and-greets with storybook characters, a kid-friendly DJ, and autograph sessions with players and coaches. Meanwhile, parents can watch other football games on the big-screen TV&apos;s, purchase merchandise, and watch the ESPN 1420 Pre-Game Show. When the gates open up until 30 minutes before kick-off, meet under the bell tower inside Cajun Field to sign up your aspiring athletes to participate in the McDonald’s McDash. Before the game, children 12 and under get the chance to race across the field to the cheering of fans. All runners get a free T-shirt. If your little ones are squirming in their seats during the game head over to the grassy end zone known as “The Hill” and throw down a blanket. Kids can run free, roll around, and cool off with an ice-cold Cajun treat from the sno-ball truck. 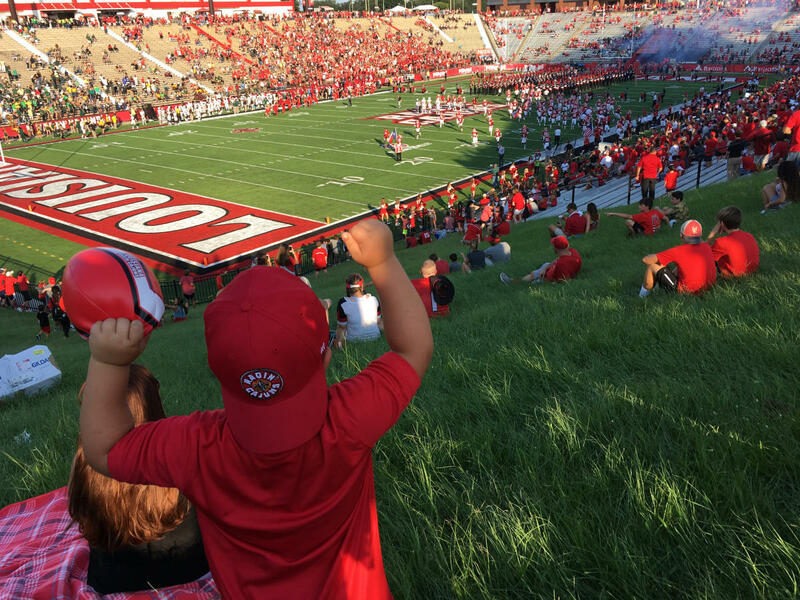 Children will stay entertained throughout the game by Cayenne, the Ragin’ Cajuns&apos; mascot, as well as eye-popping fireworks during the national anthem, Ragin’ Cajuns touchdowns, and victories. Before or after the game, be sure to stop by the University of Louisiana. The quintessential Southern campus is perfect for introducing school-age children to college life. Stroll around campus and admire massive oak trees and turn-of-the-century classic architecture. At the campus’ center is Cypress Swamp, a beautiful habitat for fish, birds, turtles and even colossal alligators! 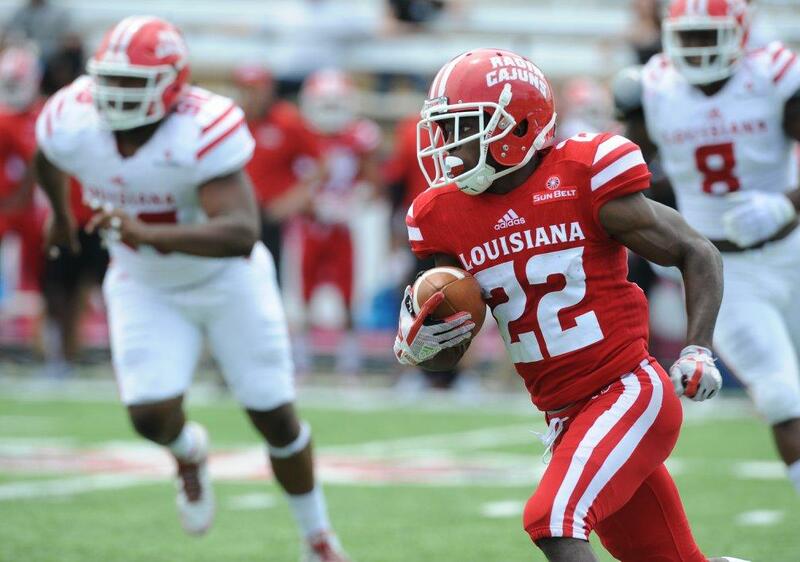 Louisiana Ragin’ Cajuns home games are played Saturdays this fall on Sept. 1, Sept. 22, Oct. 13, Oct. 27, Nov. 10 and Nov. 17. While diaper bags are not allowed in Cajun Field, parents can pack baby bottles, blankets, and other supplies in a 12x12 clear tote bag. 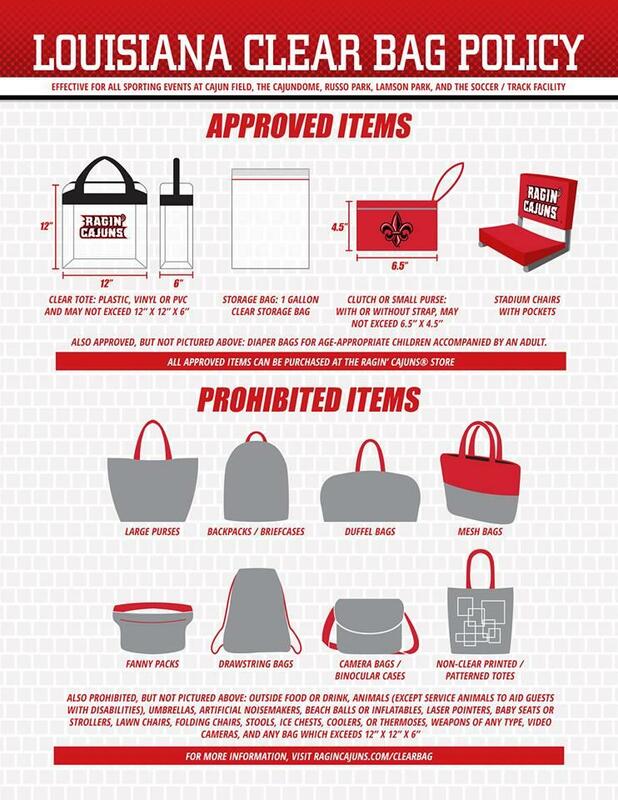 See below for a visual guide for the bag policy. Remember to arrive early, wear red, be loud and stay late. Geaux Cajuns! Laura loves traveling around the country with her husband and two young boys, and especially looking for adventures at home in South Louisiana. A former travel magazine editor and tourism marketing director, Laura is currently a freelance writer, a columnist and mommy blogger. She loves playing tourist in her new hometown of Lafayette where she can’t get enough of the colorful Cajun culture. Her work can be found at www.lauraanderslee.com.